Memory is a fickle beast. Humans are terrible at remembering things. This is fine, even important. Our brains are heavily optimised toward making sure that we can keep track of things that, evolutionarily speaking, are important to us, and that comes at the expense of culling a whole lot of things that aren’t. The way that we process experiences and store memories itself is convoluted as well. If you’ve ever looked at a clock, been satisfied by what you see, and then looked away only to find that you still don’t know what time it is, you’ll know what I’m talking about. In this case, your conscious mind made determinations, but didn’t bother to store any of that information. The opposite often happens too – you may find that sometimes you remember reading a word or hearing a song lyric, but didn’t consciously process that at the time. There’s a dominant perception that repetition is the key to remembering things, but I like to look at it slightly differently. To me, resonance is the thing that helps us build memories, and repetition is just one way to evoke that. Things that move us, things that make us think, things that frighten or elate us are often as lasting, if not more so than, say, repeating someone’s name back after being introduced to them. When we tell stories, sing songs, or paint artwork to share with others, we often look for ways to make them resonant with their audiences. That can come both from within the work’s cultural context (three act structures are a very established storytelling device that through shared expectations allows an audience to more easily engage with and find certain kinds of resonance within stories that make use of it) and from within the work itself (events within the film Memento find new resonance when they gain new framing at the climax of the story). In The Away Team, we present players with a lot of experiences. One of the things that I worked toward with The Away Team’s now-released Lost Exodus update has been increasing opportunities for interesting moments to have presence and resonance beyond their immediate context. This post will dive into some of the ways I tried to tackle this. There’s a big, long, and healthy debate to be had on the value of extrinsic rewards and the impact they have on players’ perceptions of and approaches towards playing games. To keep this post at a reasonable length, we’re not going to touch on that here other than to note that they are not always an ideal fit for all games or all players. Working backwards, one of the last things we implemented in the list of items this post covers was Steam achievements. The Away Team originally shipped with a set of ten achievements, spread out between highlighting good/bad endings, and running into the consequences of resource scarcity. Each of these were named with quotes from noteworthy literature – in this case, poems that focus on or mention the sea. Coming up with the new set of 11 achievements was pretty simple. Prior to the Lost Exodus update, the game had no way of storing data between runs. With the addition of cross-run stats tracking things like light jumps, distance travelled, planets visited, and crew killed I was able to quickly come up with a list of 8 that would on average be unlocked after 5 or so runs, plus 2 more achievements for initial progress toward finding less easy to discover things – one for mementos (which we’ll come back to later) and another for research missions (which we’ll touch on next). The last achievement was for finding a new hidden crew member (who we’ll talk about in the next section as well). Since most of the new achievements were based on collecting all of something or doing enough of something to pass a threshold, they all became stat achievements rather than event achievements, making progression more visible in players’ achievement lists. My hope was that by focusing primarily on late-game stuff (whatever that means in a game that expects players to play multiple runs), they’d supplement rather than crowd the initial achievement list and also maybe lead players who might not otherwise think to play beyond their first run to have a go. I didn’t have access to source images for the original achievements, but since they were small and hadn’t suffered too much to Steam’s heavy jpeg compression of achievement images, I was able to just copy and paste the border from the old ones. Using existing assets including some unused sprites for phenomena from the research missions, I was able to slap together the whole lot in a couple of hours. Coming up with names that matched Michael Fiegel‘s quotes was a bigger hurdle (there’s nothing that makes a writer feel inadequate more than trying to emulate a more well-read writer’s work!). In the end, I opted to move away from the sea theme of the original quotes, steering more into works that exist within the popular consciousness. Even with the slightly looser requirements, finding appropriate quotes was still a challenge. They had to be short enough, the literal meaning of the words used and the contextual meaning of the quoted passage had to feel resonant with the concepts the achievements represented, and the intention/common reading of the work itself had to not be at odds with the quote’s context in game. It took nearly a week’s worth of evenings scouring through poems, short stories, novels, epics, plays, songs, and even films (with the assistance/tolerance of my wonderful partner Mim) before I managed to pull together a set that felt like it fit. I ended up quoting Carl Sagan twice, but I figure if you’re going to give double stage presence to someone, that’s the right person. Ideally, it would have been nice to also track and implement a way of viewing these in-game so that we could present them to players outside of Steam as well, but as we got closer to the launch date, this was one of the things we had to let fall by the wayside. Maybe we’ll find time for it in the future. After reading through a lot of feedback/reviews (both positive and negative) for the game, I came across an interesting through-line that echoed behind a lot of players’ different perspectives/opinions – the events that happen in missions are distilled down into three numbers (food, fuel, and crew deaths) giving little incentive to care about or remember what goes on in missions. This wasn’t precisely true for the missions along the story chain, since each one gives players’ the next as their new objective, but since that text isn’t visible after a mission ends and players encounter far more than just that chain, it’s easy to come away with an impression that so long as you get enough fuel and food (and don’t loose your fuel), the missions themselves don’t have much impact on the game. That view also ignores the interesting narrative nooks and crannies that some choices can lead into. We had implemented the new sector summary screen as a way of addressing a number of goals we had for improving sector exploration, but I purposefully left room for a “notes” section, which is populated with some quick reminders on what the next story planet is and what lead to that becoming the player’s goal. For our early testers, this helped tie the main story chain of planets together in a way that was easier to overlook previously, and it also allowed us to give what was previously mission content presence out in the rest of the game. I’m not entirely sure what (if anything) was originally planned to be displayed on the right side of the crew screen, but that empty space with the Away Team emblem on it was evocative to me. I can’t really say what, but something about it reminded me of the medal cases from the LucasArts X-Wing and TIE Fighter games (if you absolutely need more of me waffling on about Star Wars games in your life, go here). In those, the medal case was a way to be reminded of what you’d accomplished, which in my mind was the sort of thing that The Away Team’s missions needed – a reminder of interesting or key moments that would otherwise disappear after a mission ended. I had a pretty clear vision from the get-go about what form this would take in The Away Team, and in the interests of steering away from the trophy/medal interpretation, I started calling them mementos. Since you as the AI never go down to the planet, there’s no direct way of making it something you receive, but the crew are sentimental humans who are probably likely to take a photo of a sunset or pick a nice flower (neither of which are in the game, but you get my point). Per-character inventories would mean that in addition to being reminded of something that happened, you’d also be reminded of who it happened to – Aairik had a close call and keeps his cracked helmet for good luck, or Mychal was the first one through the door and grabbed a photo of the vista beyond with their suit cam (neither of which happen in the game). I spent a few weeks reading all of the mission scripts from start to finish multiple times to find the best spots to hide mementos. This was also helpful since it helped me find and fix a whoooooooooole lot of mission bugs, identify places where I could slip in extra bits of story, and immerse myself in the game’s tone in a way that was helpful for writing. Since the game already had little rank sprites given to crew who survived missions, I felt like it would be good to also add some “dynamic” mementos. These would be ones that we’d automatically give to characters, and update the images and descriptions for as the game progressed. I styled them as though they were flight patches, and their descriptions became a list of the planets and stations that the crew member had been deployed to. It felt like it might be interesting to also track which missions a given character was assigned a particular role on, and made matching dynamic mementos for the leader, medic and engineer roles. I was really surprised at how well the caduceus came out in the medic symbol (obligatory note that the Rod of Asclepius is the proper symbol for medicine) – I was convinced that I wouldn’t be able to get it clear and readable or give it any sense of dimensionality at such a low resolution, but I somehow managed to pull it off! After talking it over for a while, we ended up deciding that we could implement a simple experience system based on deployment roles without much hassle – each of the three roles maps directly to one of the three hidden attributes that every crew member has (leader to the social stat, medic to the physical stat, and engineer to the mental stat). The crew members in those roles typically undergo stat checks for the corresponding attribute in most missions to determine outcomes, so a little stat boost for the crew member filling that role at the end of a mission would be something that players could use to make their preferred leader a little better, or to raise up their entire crew. The boost isn’t big enough to break balancing significantly, but it does influence late game outcomes a tiny bit, which is particularly interesting for missions off the main story chain, which randomly occur. The result is slightly more interesting decisions when deploying crew, slightly more varied experiences across multiple runs, and increased prominence of mission outcomes across the rest of the game. One thing that I’d have liked to have done, but couldn’t squeeze in, was a unique starting memento for each of the characters that ship with the game that would connect back to their history on earth and be a tiny window through which to present some more characterisation. Xzavian might have dog tags from his time in the military, Emerie might have a trophy from an athletics tournament, or Kealan might have his certificate of office. My initial plan was that the description for each could change when the character died, poignantly calling back to who they were in life. As a low priority item, it fell off the todo list as we closed in on the Lost Exodus release date, but I did find time to add a generic death memento that has its description set in-mission, explaining how the crew member met their demise. They’re less emotionally charged than I’d envisioned the starting mementos ending up, but I wrote them with a directness/dryness that I think fits with the AI’s personality – those silly humans, always running off and getting themselves killed. Pixel art has never really been my forte, and most of the art I’ve done for The Away Team has required me working well outside my comfort zone. As an artist, this has been a fun challenge to rise to meet. 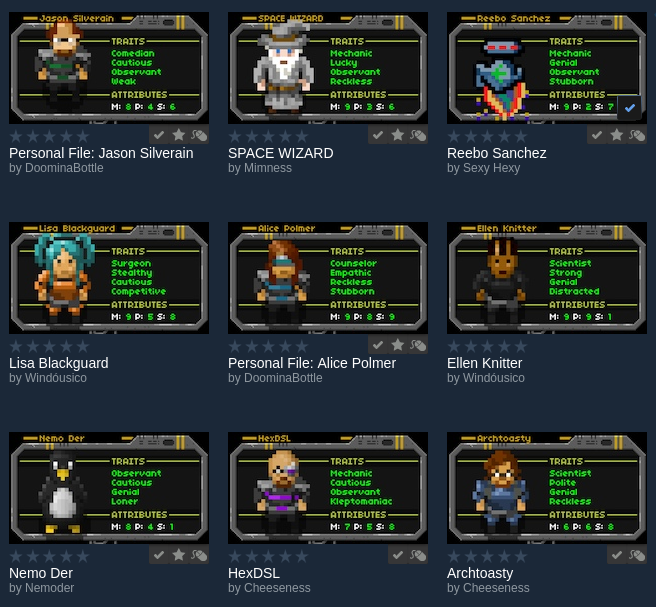 Initially I was very anxious about the amount of work that the memento sprites would involve – including dynamic memento variants, we shipped 70 with the lost exodus update (to give that some context, there were only 153 sprites in the whole game before I came on board). I tried to get the most spoilery ones out of the way first, and did some of the rest while streaming as a way of capturing my exploration of/growth in doing pixel art. Since I knew I had a lot of work to do, I decided to paint the photo mementos (images that the crew captured via their suit cams rather than physical objects they collected) at ten times the resolution, and then scale them down with linear or no sampling in order to stop them getting blurred too much. This worked pretty well, since I was able to use techniques that I was much more comfortable with (and that I could be sloppy with, since I obviously would never show off the higher resolution versions in a blog post or anything) for a good chunk of the mementos I needed to make. Out of these, I think I like the Pearl (Panshin 68) beach, the Gold (Le Guin 49) caldera, and the Story4 (Drake 77) “aquarium” the most. Almost all of the other mementos I created by drawing a solid silhouette, and then adding detail via value and hue. Sometimes I’d work with a 1×1 brush snapping to pixel boundaries, sometimes I’d work with a larger brush, or use more advanced painting tools to quickly get effects I wanted. At lower resolutions though, some of these tools give different kinds of results – when you’ve got 3 pixels to work with, smudging to get a nice gradient is a very different proposition to a higher resolution image for example. Pixel art means a few different things to different people. In my mind, it’s a term that focuses on the technique of creating a picture by placing/moving individual pixels. That’s the skill that I feel like I don’t have. Low resolution art created via other techniques is less challenging for me, so it’s an area I feel less drive to develop my skills in. All up, I’m proud of what I was able to pull together. The Protein Strands wrapper and the stuffed pig stand out as my favourites. They’re the ones that I wasn’t sure I could do, but had a solid idea of what I wanted and was able to work directly toward that (most of the others, I kinda had ideas, but had to noodle around a bit until I found what was working). Finally, we made the crew screen show up whenever the game ends as a chance to review mementos and crew members before accepting failure or being rewarded with an ending screen. Not only does this allow any mementos picked up during the player’s last mission to be seen, but through all of the past mementos and rank badges, it also encourages players to reflect on everything that has happened to them since the beginning of that game. The first thing that attracted me to The Away Team was Michael Brune’s post talking about why he wanted to release a Linux build. What made me fall in love with the game enough to offer to fix some bugs and eventually do the work you’re reading about here was Michael Fiegel’s writing. When I hopped on board to fix some bugs, it wasn’t with the expectation that that would lead to the opportunity to do some writing for the game as well, but I have to admit, it was definitely something I was open to/excited about doing if the opportunity arose. While making new stories was what I was most excited about, the majority of the writing I shipped in the Lost Exodus update focused on either supporting new mechanics or tweaking/expanding the existing writing. That said, excluding stuff that didn’t make it into the game or that I rewrote, I estimate that I wrote somewhere in the order of 40k words – close to half again on top of the 85k the game’s original release was advertised as having in the original trailer. These numbers are all conservative, of course. Given the amount of branching and per-character variations that exist within the game, it’s hard to reliably say. The last time I did a proper count (which itself is fiddly since it’s all embedded within mission scripts and json definition files), the stuff making it into builds was between 135k and 140k. Adding another hidden character into the game was also something I wanted to do, and although that wasn’t initially Savio I’m pretty happy with how he and his arc came out. The path to finding Savio (for me) lay in an oddity I found while working through the mission scripts looking for areas that we could improve. A certain choice in the Pearl mission (which you’d know as Panshin 68) would lead to the crew entering a section of the crashed Epsilon Omega (I said there’d be spoilers!) that had an opportunity for some characters to die, but didn’t really do anything beyond that. To me, this felt like an obvious place to put a rescue-able character, some further danger, and an opportunity to highlight that for both the crew and you as the AI, some of the mysteries can’t and shouldn’t be solved. “You had hoped to be able to find more answers, but maybe there were never any answers to be found,” was a line I’d written long before I touched that mission. As with almost everything I do, I wrote more of Savio than I planned to use, and that extra work helped guide me to places where I could slip in extra details. In his extended backstory, Savio’s role in the Epsilon Omega’s eventual colony would have been a civil engineer, working with the ship’s AI to plan, construct, and grow human-friendly spaces for the other colonists and the future population that travelled on board as embryos. While he’s thankful to be rescued by the player (if he’s alive), this does mean that the role he originally left Earth for is vastly different from his new role as part of the Argo’s crew. Weaving his presence into existing missions, most notably in Ruby (Rusch 27), Story4 (Drake 77) and Story5 (Ellison 2e) was rewarding, but also a little harrowing. Savio’s journey is emotionally charged, and writing that sort of thing (for me at least) involves immersing myself pretty deeply in the emotions I’m trying to convey, and that’s very draining. I feel pretty proud of how it came together though, and I think it has some nice closure depending on the ending(s) you find. I didn’t draw his character sprite (he’s one of Chris Nordgren‘s) or come up with his name (Michael Fiegel’s name generator spat it out), but I wrote his story and painted his family, and he is dear to me. If you see him in-game, look after him for me? I also found opportunities to make certain plot points stand out and feel a bit more meaningful. Aislinn’s baby (no excuses now, you were told there were spoilers!) is the best example I have for this type of work. The game gives opportunities to discover her pregnancy across the course of a few missions, and while I don’t think it’s in the AI’s nature to care much about how it happened, I did feel there was room to touch on it for the ending that sees the crew live for a couple of decades on Ellison 2e. It’s only a short moment, which hints at Aislinn’s independence causing friction with the planet’s doctors (I guess the medicalisation of birth has extended to space), but in my eyes, it also says something about your crew and your mission. Regardless of what comes next, that moment is the first propagation of humans (the humans you left Earth with and are responsible for) in hundreds of thousands of years. Regardless of what comes next, that is the moment that your mission is accomplished, which re-frames the remainder of the AI’s actions within that ending as something you did for other reasons. Characterisation in general, or at least the impression of characterisation since we now have custom characters thrown into the mix was something I tried to give attention to as well. There are a few instances where it makes sense for the AI to engage in banter with the crew, and I think Michael Fiegel did a good job of making sure that these were present and used effectively – although the AI you play as doesn’t feel emotion and doesn’t specifically need to be attached to the relationships it/she/he has with the crew, it is clear that you understand why those things are important not only for the crew’s well being, but also for their comfort. Interactions between the crew members themselves though, was less present in the game, and that was something I tried to add here and there in places where it wouldn’t interrupt or detract from the existing text’s flow. These aspects were also something I tried to make sure I included in the new missions I wrote as well. One of my favourite new bits that I was able to pop into an existing mission is something that players will likely never see, and is more about how a crew member interacts with themselves than with others. When more than one crew member is present at the climax of Story2 (Benford 65), sending a Cygen character in will result in them sacrificing themselves in order for the remaining crew to escape. 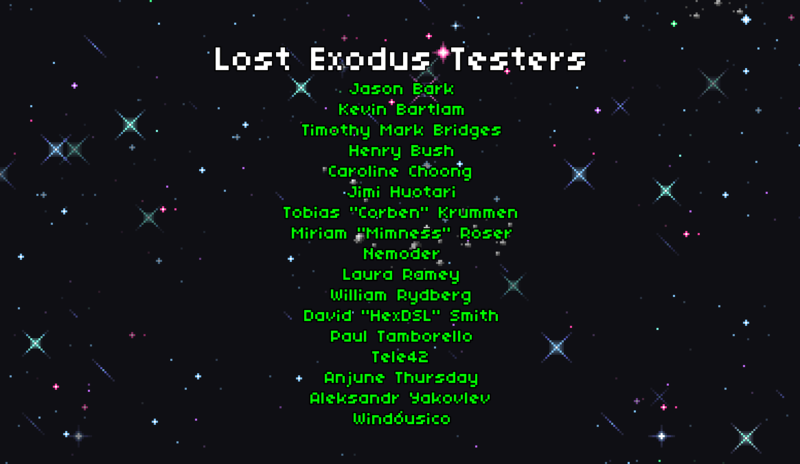 When the last character is a Cygen crew member, the ship can’t escape orbit unless they remain behind, but since there’s no mission without the crew, there’s no incentive to do that, so I wrote 7 little endings describing the final days (most of these won’t be discoverable without custom characters). It is hopefully less morbid than it sounds, and gives some much needed character to what was an abrupt and generic ending. Without a (comparatively) complex relationship system, it’s hard to do anything that feels realistic, but less is often more, and The Away Team’s minimalism hopefully allows the player to infer attitudes and relationships in ways that help any given crew feel like they have a little more dynamics than they did previously. While working on ways to improve sector exploration (something for another post), one of the things I pushed for was events that could occur while travelling. Some of these would be a way to show day-to-day life on board the Argo, and some would show the crew’s reaction to/allow the player to respond to unusual situations, but all of them would contribute to giving the AI, the ship, and the crew more presence and prominence. The first of these event missions that I wrote (internally called Helium) involves a hull breach – something that shouldn’t be possible, and is the result of several systems malfunctions that leave the ship’s survival in the hands of the crew. I’d initially scoped it to be a much broader mission that tracked depressurisaton of the ship and had that play a role in how repairs could be conducted, but as it came together, I realised that it didn’t need to be that complex, and that it would have been about three times the size that I wanted random events to be (they’re intended to feel much smaller than planet missions and in that way highlight that those are the focus). My main goals with the Helium mission were to give a little more presence to the ship and its systems, and to create a situation where the AI becomes reliant on the crew (structurally, it’s not really any different from a planetary mission, but the reversed narrative framing hopefully gives it a different tone). There are what I hope are some fun moments in this one, and some differences for crews of one or two characters that I hope will provide some interesting variations for anybody who comes across those. Another event mission I wrote for Lost Exodus gives players the opportunity to investigate and research interesting space stuff. I wrote a single mission file that was capable of generating a formulaic mission for one of ten different phenomena (two types of black holes, neutron stars, interesting coronal mass ejections, and four types of interstellar/trans-solar objects), not counting false positives. These get assigned generated names loosely based on current naming conventions for stars, black holes, interstellar objects, etc.. If a crew member was the one who discovered it, it’ll also get prefixed with their name. The structure goes something like investigate->study->analyse->end, with potential costs at each step and potential rewards if the study provided anything of value. In some cases, this might be a minor sensor or engine upgrade. There’s not a lot of character interaction here, and it is primarily presented as the AI doing the research – something I hope the predictable structure and consistent methodology will reinforce. There is also the idea that a break from incessant travel and deadly planets might be good for the crew’s morale, but it’s a decision you as the AI drive. I had a few other mission ideas that I’d have liked to explore for Lost Exodus that delved a little more into what the crew gets up to between planets, and even one or two planet concepts as well, but I feel good about what I was able to bring and hope that my tweaks, expansions, and additions help round out and elevate what was already there. I didn’t really get much opportunity to do audio work on The Away Team, but shortly after implementing delayed crew deaths (so that crew would die after the paragraph that describes their death becomes visible, rather than immediately after the choice that leads to their death is made), I found myself with a few minutes to spare, so I grabbed my field recording gear (a Rhode shotgun mic + blimp and a Zoom H4n Pro) and ran around the house banging things with my fingers, with a mallet, and with the back of a toothbrush. I pulled all of those into Audacity and slowed them down a ton, while also reducing their pitch and giving them a bass boost. A few of them stood out as being good fits (I think they were tapping the top of my freestanding stove with a finger, thumping the grille on my livingroom heater with a closed fist, and banging the loose metal panel on the back of my desk with a knuckle through a hand towel), so I layered them together, using compression filters and limiters to make it sound even bigger. The sound itself isn’t amazing, but it’s passable, and having a sound in there really, really makes you notice when someone dies (something that I think the game had issues with before). Coming to the end of this post, the very first thing I felt motivated to add to The Away Team was an equivalent to an ending cutscene. In previous versions of the the game, the last thing you would see would be the words “MISSION ACCOMPLISHED” or “MISSION FAILED” as part of the mission text, then you’d click the leave button and return immediately to the main menu. I grew up in an era when the internet wasn’t really accessible, and when playing games (or even having a computer at all) wasn’t as ubiquitous as it is today. I played in comparative isolation and without people to tell me otherwise, I found cutscenes to be like treasure. They typically showed an alternate, high fidelity view of the world and characters that existed in my imagination, and they added a lot of weight to moments that might otherwise not stand out so much – take the closeup of Guybrush’s face in The Secret of Monkey Island when Meathook flips a lever and flees in terror as the door raises to reveal a not-so-terrifying monster. I felt like The Away Team’s endings could use something like that. Each of the mission successes had interesting imagery in Michael Fiegel’s writing, and as I would eventually do with the mementos, I wanted to find a way to make those stand out and have more of an opportunity for a lasting impact. Of course, that isn’t to say that the text isn’t capable of being memorable on its own. After all, it was that memorability that inspired me to want to paint these scenes. It felt important to keep them minimal and avoid clashing with the game’s imagination oriented experience. I opted for still images (60fps cutscenes would feel jarringly out of place) which echo each of the success and a couple of the failure endings of Story4 (Drake 77) and Story5 (Ellison 2e), and painted these at the game’s original resolution of 1280×720. After the big scaling update though, I pulled them back down to 640×360. I have mixed feelings about this, but I think they still look good – plus I can show some higher res versions here and have them feel special. There are 9 all up (plus a variant if Aislinn happens to have her baby) and with one exception, they only show the ship; this is (ideally) the end of your story, not your crew’s. Some of them stayed very close to my initial thumbnail sketches, while others took a few iterations for me to end up at the final version. The end screen that we call “Monument” initially started as a makeshift shelter that the crew had (with your help) converted the remains of the ship into – it turns out that when I was initially sketching ideas, I’d misremembered the ending that results with the Argo on the surface of Drake 77. The Away Team is a game about a small crew’s journey through the isolated and mostly empty reaches of time and space. Most of The Away Team’s gameplay and narrative are presented through “missions” that take place on the surface of the planets you come across. So much of the tone and context of the game is about eking out an existence with limited resources onboard what is effectively a very advanced tin can. In many ways, the Argo is more than just a vessel. It’s the “body” of the AI you play as, it’s a home to the crew, and it’s also the cage they are trapped within until your mission reaches a conclusion. That said, the game itself presents very little of the ship and what that life is like for the crew. When I first started working on The Away Team a year ago, one of the things that sat at the top of my wishlist for new features was to give the ship (and its shuttle) a little more presence in the game. For this post, I won’t go over how exactly we’re doing that in the upcoming Lost Exodus update, but I will be looking at some of the concept refinement we did along the way. While we still don’t show or describe the specifics of the ship in great detail, a consistent design for the Argo helps us avoid contradictions and make more conscious use of the ship as a location. Expanding on The Away Team’s original style while also preserving it is important to me, and so in this sense, the kind of work we needed to do was backwards. Instead of using concept art to inform final game art, I needed to use Chris Nordgren‘s final game art to inform concept art for new stuff. The idea is to end up with new art that feels like it fits with what the existing art is communicating. Beyond that, there were a couple of iterations of placeholder and WIP art that I had access to. While they’re interesting heritage, they don’t really contain elements that are relevant to where the shipped art ended up. On the left is the first placeholder ship image, based on a ship created by wuhu on OpenGameArt.org. Progression toward the final design of the shipped art can be seen across the two remaining WIP ships. Perhaps the most important reference came in the form of the in-game descriptions of the ship and its systems written by Michael Fiegel, which talk about the length of the vessel, its major components, and in some cases, their distribution across the ship. We’ve tweaked these a tiny bit for Lost Exodus to maintain consistency across the entire game, but Michael’s writing is really the heart of the game and is the mass around which everything else orbits. The very first piece of more detailed ship art I did was a rough placehoder of an aft (rear) view that I needed for a mock-up, where it sat behind foreground elements to give a little more definition to the ship and a little reminder that the ship is there. I wanted to let the ship’s engines/thrusters have the most prominence here to suggest travel and forward progress. Balancing myself between multiple projects and multiple disciplines meant that I wouldn’t return to ship art for a few months – all of my Away Team time went to other bits of art, writing and programming. In early march, while taking a few days off, I started to do some sketches of the shuttle. I wanted to try and maintain the general shape hinted at by the shipped art. Even though you never see it separated from the ship in any of the shipped art, the shape of the front of the shuttle is visible to an extent. None of these scribbles ended being used, but they were useful in getting me in the right frame of mind to come up with something that worked. You can also see some orb shaped engine ideas and a little “view looking out the rear shuttle hatch” sketch. Another month later, I had a shuttle design that felt like a good fit. I like to do rough little scenes to put my designs in to help give me a sense for how they might feel when actually used, and so I painted a little scene of the shuttle on a darkened planet with light spilling from the open rear hatch while three crescent moons shone down from above. At this time, I also started and abandoned a larger piece of concept art showing the shuttle flying through clouds, causing swirling eddies in its wake – we’ll come back to that later. From here, we were at a point where there was value in starting to solidify the look and feel of the ship. I needed to have certain details defined and locked in before I could move ahead with other work. I spent a few days sketching out ship concepts and pulled together my favourite three into candidates that we could discuss and review. Each design embraced different elements of the shipped art and took different liberties. I tried to think about the ship’s structure and features while working on these – where does the shuttle end? Where would the cryopods be? The in-game text describes most of the ships systems as being external so that the crew can’t fiddle with them, so where might each of them be located? I also did side views for each design. Interpreting and expanding on details suggested by the shipped art is a big challenge. To me, the most important thing is maintaining as much of the “character” of the source artwork as possible. The possibility space in low fidelity art is very broad, and narrowing that down runs the risk of denying people their existing interpretations. I’ve had a little bit of experience with doing this kind of work in other projects, so it wasn’t as daunting here for me as it could have been, but it’s still a big responsibility! To help make sure I wasn’t overlooking particular angles, I did some super rough 3D mock-ups. I these used to inspect and think about aspects of the ship that weren’t readable/inferable from the top or side views. My plan was that we’d be able to swap in/out our favourite bits to make one final design, but in the end, after less discussion than I was expecting, we settled on design number 3. With that bedded down, I was able to move ahead with some other features, which included finishing up that aft view and a corresponding side view. There’s something fun about the stockiness of this design that I like. It is also arguably the one that most closely represents the detailing of the shipped art. Below, you can see the final versions of the aft view that my very first sketch was of. Pixel art isn’t really my forte, but The Away Team has provided me with many opportunities to hone my skills. Doing the detailing on these was a lot of fun! These images won’t really be seen like this in the game, but I feel like the presence they do have helps convey a sense that the ship is an ever present part of things. I’ve now painted the Argo a bunch of times, but this one of the ship in front of a hastily drawn black hole was the first time I tried to paint our selected design as a whole. For the next several months, I spent most of my time working on programming and writing. Since some of the new mission text references or takes place within the ship, we felt the need to stop and settle on some solid details for the ship’s internal structure. There were some small inconsistencies about things like how many rooms there were in the text of a couple of existing missions, and likely a number of different visions for how the ship should look while The Away Team was initially being developed. Since none of that was really explored in any detail in-game, that didn’t matter so much. Now that we were looking to make these spaces feel more real to players, we needed a solid plan! The Away Team’s project leader Michael Brune put together this handy reference for a “single room” vision of the ship, with the front section being the shuttle (with the orange dots showing the crew’s seats), and the rear section being the crew’s quarters (with the light blue regions housing the cryopods). Based on the things I’d loosely been thinking about when doing the exterior designs, I scribbled out some ideas that took into account dimensions and volume sizes. From there, we settled on a three room layout that puts an airlock section behind the shuttle docking region, and what we’ve been calling the “machine shop” to the aft. The machine shop is where the ship’s internal drones store and maintain themselves. It’s not primarily meant for the crew’s use, but they might be able to find some tools to use there from time to time. We may not end up showing many of these places in detail in the upcoming Lost Exodus update, but nailing down specifics helps us identify where the crew might be in particular situations, how the crew might navigate the ship during emergencies, or where a crewmember might go if they want to try to feel alone on a ship with little privacy. I mentioned earlier that I’d started a painting of the shuttle in some clouds early on, but had abandoned it. Since painting art that we weren’t planning to put in the game is difficult to prioritise, more polished pieces of concept art often have to be put aside when time is limited. When it felt like this one wasn’t coming together in the way I wanted, it made more sense to just let it go and focus on actual work that the Lost Exodus update needed than to spend a day wrangling it into submission. Here’s a look at how far I got with it before setting it aside. I’d done a sketchy rendition of the shuttle, and had some reference lines to indicate where the air flow that would cause cloud swirls would go. It’s a lot easier to step back from a piece of art when it’s still a scribble than it is to do so when you’ve sunk a dozen hours into it, so being able to identify early when a piece isn’t working right can be an important skill. Months later, after we’d finishing implementing a lot of the key features we wanted to get into the Lost Exodus update, Michael mentioned that he still really liked that piece and was using it as a desktop background. Since I felt a little less under pressure, I decided to spend a day seeing if I could finish it off. It took a couple of iterations (including modeling volumetric clouds in 3D and using physics simulations to blow them around), but eventually I came back to the more painterly thing I was aiming for initially. Here’s an animated GIF showing how it came together! Here’s the final version (or at least, final for now – maybe I’ll decide it needs a little more tweaking at some point), which has just a tiny bit of colour in it to hint at the tops of the clouds being lit by a setting sun. I’ve provided a few variants with different logo placements just in case anybody would like to use them as desktop backgrounds and has a preference for logo placement. I hope you’ve enjoyed this look at some of the work I’ve been doing on The Away Team. It’s been a lot of fun, and I can’t wait to share it with you when it’s ready! The Away Team is available now on itch.io and Steam for Linux, Mac and Windows. For more The Away Team: Lost Exodus news, subscribe to the Underflow Studios mailing list!